I’m writing all month about living local. About embracing where you are and living within your zipcode and finding new ways to just be present in your own corner of this world that God has fashioned just for you, for this time, for this season, for this moment in your life. I love where I live; I love my locale. I love the mountains and the pastures and the cinema-style small town that is my real life. I love that the grocery clerks know mine and my children’s names and that my former students serve me at our favorite quick places to eat. I love that I’m a part of this community, its theater, its churches, its schools and volunteer organizations. But sometimes, I have to reach out from here a bit to find a little more of what I need. 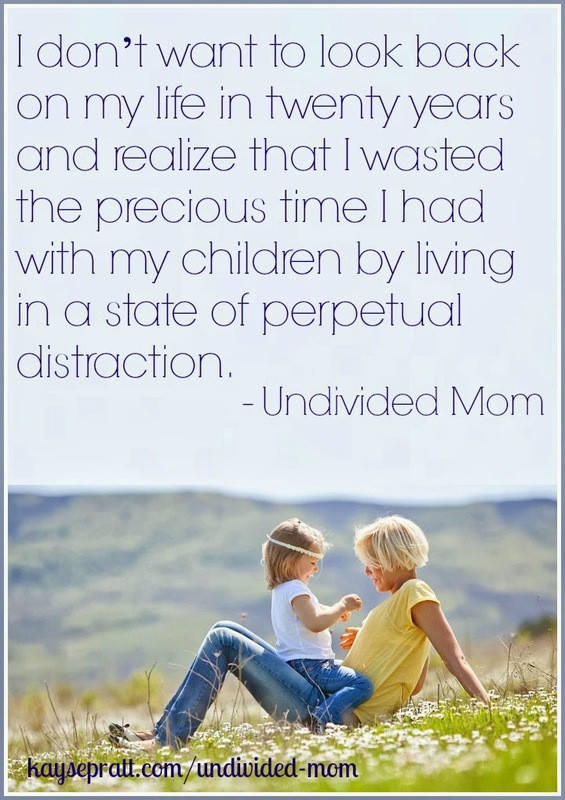 And when I do, I’m more content with where I am, and I’m less alone in this everyday chaos that is motherhood. That’s how I found Kayse. She’s way over on the west coast, but she’s a former teacher, a writer, a mama, an encourager of women, and a friend to me. No, she’s not local. She can’t bring me a casserole on a bad day or meet for a pumpkin spice latte to celebrate fall. But she can reassure me that I’m not alone. I’m not the only one balancing how to make this writing gig a career while raising small children. I’m not the only one who’s sometimes living for naptime. I’m not the only one who wishes just getting laundry done was enough accomplishment for each day. I’m not the only one who sometimes feels forgotten. I’m not the only one who struggles to find Christ in the chaos of motherhood. I know she shares these burdens because she bares her soul (and her unfolded laundry) to tell us about them in her new ebook The Undivided Mom. It’s here, among these pages, that you’ll find wisdom from a mom who hasn’t just BEEN there; she IS there. And in a few weeks? She’s adding a precious baby boy to her motherhood mix. But she took the time to share her heart with us mamas who feel so divided between motherhood and careers and home and marriage. She’s not giving us a formula to fix anything. Instead, she’s giving us a Savior to seek for all those moments when we feel pulled in a million directions, because she knows (and so do I) that seeking Him first will help us find margin in our busy everyday lives. But I can step away from the things that can wait. I can invest fully in quality moments with my daughter. I can show her through my actions that she is completely loved and valued. She [Martha] couldn’t see past her to-do list to realize that the Savior of the world was sitting in her living room. Reading this short (14 days!) devotional has reminded me that no matter where I am, no matter what local I am calling home, my perfect home is in Christ and He alone will satisfy my soul. I encourage you to click a link and check out this book (and Kayse’s other great products) on her site. Today she’s hosting a giveaway of the book and basket filled with DaySpring goodies! Buy anytime this week and use the coupon code UMLaunch20 for 20% your entire order! If you’re on twitter, we’d love to have you join us tonight, October 7, at 9PM EST for a twitter party loaded with giveaways and excitement for the community we build as mothers who encourage one another to find our knees before we find the next lost sock. Sometimes living local is about supporting those who surround you. Sometimes it’s about finding those who share your heart. For all posts in my #31days series click here. Disclosure: This post contains affiliate links but the opinions are my own.